Bull. Mus. Hist. Nat. (Paris) 31: 263. 1925. TYPE: Panama. Bocas del Toro: hills beyond Fish Creek Lagoon, Wedel 2276 (P, holotype). 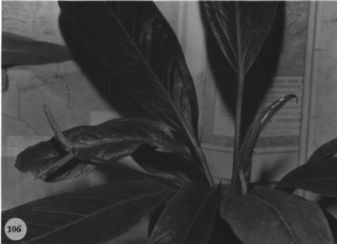 Anthurium amethyslinum Croat & Baker, Brenesia 16 (Supl. I): 20. 1979. tyi'e: Costa Rica. Cartago: along road between Moravia (east of Tuis, SE of Turrialba) and Quebrada Platanillo, 3-5 km from Finca Racine in Moravia; elev. 1,200-1,300 m; disturbed primary forest, Croat 36601 (MO 2395446, holotype; CR, F, K, NY, SEL, US, isotypes; Live plant at MO). Epiphytic or terrestrial; stem usually very short, 6-25 cm long, 1.5-3 cm diam. ; roots dense, 1.5-5 mm thick, descending; cataphylls subcoriaceous, 8-23 cm long, cordate-acuminate at apex, drying brown (B & K Red 9/2.5), persisting, weathering into fibers. LEAVES held nearly erect; petioles 9-25 (40) cm long, 5-9 mm diam., flattened laterally, sulcate with sharp margins, acute to rounded abaxially; geniculum 1-1.6 cm long; blades elliptic to oblong-elliptic or oblong, gradually acuminate at apex (the acumen down-turned), acute to obtuse at base, 8-54 cm long, 5.5-22 cm wide, broadest at the middle or slightly below the middle, the margin ± flat, continuous with margins of the petiole; both surfaces matte to semiglossy; midrib convexly raised and diminished toward apex above, acutely raised below; basal veins consisting only of the lowest pair of primary lateral veins; primary lateral veins 6-15 per side, sunken above, prominulous below; interprimary veins weakly sunken above, prominulous below; collective vein moderately straight, prominent, continuous, arising from the second pair of primary lateral veins, sunken above, prominently raised below, 5-9 mm from the margin. INFLORESCENCE pendent or arching-pendent, usually shorter than the leaves: peduncle 30-58 cm long, 3-5 mm diam., much longer than petioles, prominently 4- or 5-ribbed especially near the base, irregularly striate toward apex with one prominent sharp rib arising from beneath the spathe; spathe coriaceous, medium green (B & K Yellow-green 7/10), oblong-lanceolate to oblong, 3-15 cm long, 1-2.5 cm wide, broadest in lower third, inserted at 45° angle on peduncle; stipe 0.8-3.5 cm long; spadix yellow-green (B & K Yellow-green 6/7.5), (4.5) 8.5-20 cm long, 6-10 mm diam. at base, 4-6 mm diam. at apex; flowers rhombic, 3-4.2 mm long, 2.8-4.3 mm wide, the sides straight to jaggedly sigmoid; (4)7-11 flowers visible in the principal spiral, 5-7 flowers visible in the alternate spiral; tepals green, semiglossy, sometimes with scattered nectar droplets; lateral tepals 2-2.7 mm wide, the inner margin ± straight, somewhat turned up against pistil; pistils exserted 0.5 mm, pointed before maturity, the exserted portion broadly ovoid; stigma linear, 0.4-0.6 mm long, exserted, brushlike, with conspicuous droplets for about 10 days, becoming dry and brown, about 1 week before first stamens emerge, dry and exserted when stamens emerge; the lateral stamens emerging rapidly from the base, open in basal three-quarters before the first alternates begin to emerge at the base, sometimes emerging in a more scattered fashion, held in a close circle around pistil; anthers white, 0.5-0.6(0.8) mm long, 0.4-1 mm wide; thecae elliptical, opening flat, moderately divaricate; pollen white. INFRUCTESCENCE becoming pendent; the spathe light green; the spadix 5-20 cm long, 2-3 cm diam. ; berries obovoid to ovoid or pyramidal, pointed at apex, glossy, dark purple to violet-purple, 7-12 mm long when dry, paler violet-purple in lower third; mesocarp gelatinous; seeds 2, flattened, ca. 5 mm long, 4 mm wide, 3 mm thick. Fig. 106. The species is known from Costa Rica and Panama on both slopes at altitudes from 400 to 1,400 m, mostly in premontane wet and tropical wet forest. Anthurium michelii is distinctive for its creamy green or whitish underleaf surface and bright purple berries. Also characteristic are the oblong-elliptic leaves, broadly and sharply sulcate petiole, and the frequently conspicuously stipitate spadix. The species is a somewhat atypical member of section Pachyneurium, and appears to be unrelated to any other species in the section. The type specimen of A. michelii, not studied until recently, is aberrant and unusually small for the species and, despite the fact that it bears little resemblance to the type of A. amethystinum, the two are now known to represent the same species. Costa Rica San José: 900 m,, 22 May 1976, Croat 35323 (MO). Costa Rica San José: 1000 m,, 22 May 1976, Croat 35259 (MO).
. Panama San Blas: 300 m, 9.19N 78.55W, 30 Oct. 1984, Greg de Nevers 4125 (MO). Colombia Antioquia: 150 m,, , Hodge 7080 (US). Colombia Antioquia: Río Anori, 07.18N 75.04W, , Alverson et al. 402 (WIS). Ecuador Pichincha: 800 m,, , Madison 4011 (QCA). Ecuador Pichincha: 800 m, 00.05N 79.02W, , Rodriguez 263 (QCA, CR). Ecuador Zamora-Chinchipe:, , croat 81067 .